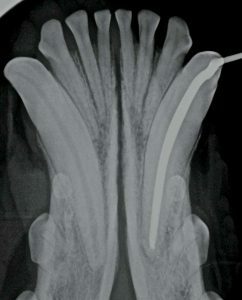 Figure 1: Intraoperative radiograph of a left mandibular canine tooth (#304) during the obturation stage of standard (orthograde) root canal therapy. Anyone who has tried to extract a firmly rooted mandibular canine tooth in a dog or cat has likely muttered the phrase, “There’s got to be a better way,” (amongst other muttered phrases!) while performing the frustrating procedure. In some cases, there is indeed a better way. Although root canal therapy is not an option for every diseased tooth, it is an elegant way to treat dead teeth and teeth with pulp exposure. Endodontics refers to the study and treatment of the inside of the tooth (pulp) and periapical tissues, the latter of which are located around the tip (apex) of the tooth root. The pulp consists of nerves, blood vessels, lymphatics, and connective tissue. Pulp tissue is found in the pulp chamber of the crown and the root canal of the root. The pulp communicates with the periapical tissues through numerous small openings in the apex of the tooth root called the apical delta. Dental pulp is important for the development of the tooth in a young animal. Cells called odontoblasts continually produce dentin internally throughout the tooth’s life. This makes the walls of the root and crown thicker. Recently erupted teeth have walls that are thin as an eggshell, and as they mature, more dentin causes the walls to thicken without changing the tooth’s circumference, resulting in a narrowing of the pulp chamber/root canal as the tooth ages. Once a dog or cat reaches the age of 10 to 18 months, the root apex closes. As the animal continues to age, the pulp chamber/root canal narrows because odontoblasts continue to produce secondary dentin, which makes the tooth stronger. Treatment options for teeth with endodontic disease depend on the animal’s age, the duration of pulp exposure, and anatomy of the tooth. 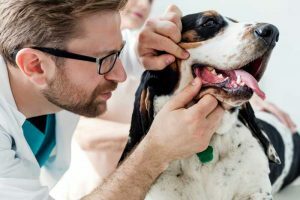 Conventional root canal therapy is usually performed on dogs and cats 12 months of age and older with endodontic disease. Treatment involves removing dead or dying pulp tissue from the tooth, disinfecting, and shaping the root canal with hand files or rotary files. After the canal has been properly cleaned and shaped, it is ready for obturation, which refers to filling of the canal with a material that will seal the apex. The canal should receive a final sterile rinse before being dried with sterile paper points. Successive paper points are inserted and removed until the points come out of the canal dry. An endodontic sealer is applied to the canal walls. Gutta percha—which is a radiopaque rubber-like material that can be vertically and laterally condensed to adapt to the shape of the root canal—should comprise the bulk of the obturation material. Vertical and lateral condensation may be performed with pluggers and spreaders, and additional gutta percha is added as needed to fill the entire canal. Pluggers have a blunt end that pushes the gutta percha vertically in an apical direction. Spreaders have a pointed tip, allowing the endodontist to push the gutta percha laterally to create room for more filling material for a solid fill. Spreaders and pluggers come in a variety of lengths and diameters. Extra-long veterinary length instruments and gutta percha points are available. The cement and gutta percha points are radiopaque, so radiographs are utilized to assess the obturation (Figure 1). Once obturation of the canal has been accomplished, the restorative filling material is placed at the access and fracture site. If access is obtained through the fracture site, only one restoration may be necessary. Usually, restoration is done with intermediate and final restorative layers. Glass ionomer restoratives are a commonly used intermediate filling material. A light-cured composite filling material is often used as the final restorative at the surface of the access site and fracture site. Teeth that have undergone pulp death become more brittle than a tooth with a normal central blood supply. A good history should always be taken to determine how the pet fractured the tooth. If inappropriate chew toys are in the environment, they should be removed. A metal crown may be indicated to minimize the likelihood of repeat fracture of the tooth, particularly in working dogs that do bite work on a daily basis. Endodontically treated teeth should be assessed radiographically at least once a year. Best left to the specialists? Next month, we’ll discuss less common endodontic procedures, including vital pulp therapy and surgical (retrograde) root canal treatment. John Lewis, VMD, FAVD, DAVDC, practices dentistry and oral surgery at Veterinary Dentistry Specialists and is the founder of Silo Academy Education Center, both located in Chadds Ford, Pa.
1 Miller BM, Lewis JR. Veterinary dentistry. In: Bassert JM. McCurnin’s Clinical Textbook for Veterinary Technicians, 9th ed. Elsevier; 2018: 1336-1339. 2 Ramey K, Yaccino J, Wealleans J. A retrospective, radiographic outcomes assessment of 1960 initial posterior root canal treatments performed by endodontists and dentists. J Endod. 2017; 43(8): 1250-1254.